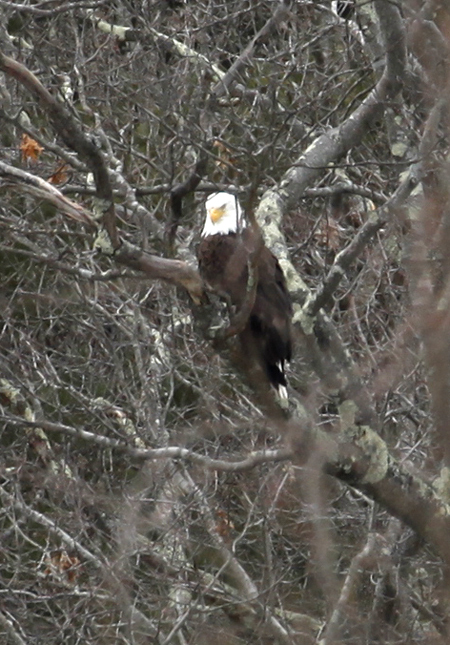 There was an article in the Hartford Courant today about how Eagles are moving south to the mouth of the Connecticut River. They like open water. 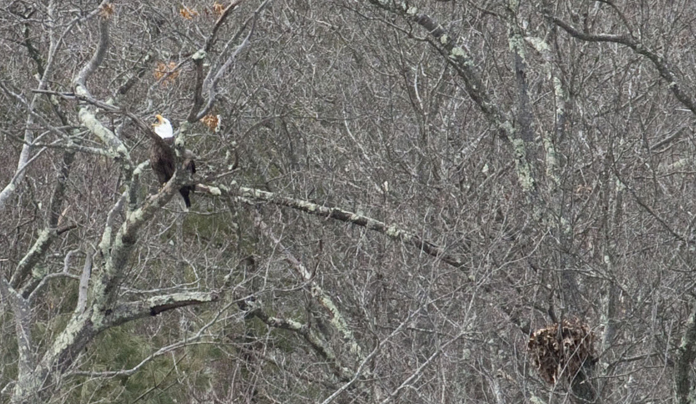 We saw a pair of Eagles a few weeks ago in Collinsville on the way to Dad’s house, but I didn’t have the 300 mm lens with me. The blow ups weren’t clear enough to post. We saw two at the time. We’ve been by again during the horrible cold, and the river was iced over there. There were no signs of them. Today I was going to my Dad’s by way of Michael’s, because I needed a circle punch. Hundreds of dollars worth of scrapbook goodies and I find I have no circle punch. How did that happen? I’m building an owl from a Big Shot die, and the pupil part of the owl’s eye is just not there. OK! I’ll stop on the way!!! I packed up to leave, and actually thought about not bringing the camera. We’ve been by that river about 4 times since we saw the Eagles, and never saw them again. The camera is heavy, especially with that lens on it. I trudge into the bedroom and pick it up. I’m bringing it. I got my circle punch at Michael’s, and I head to Dad’s house. I get to Collinsville, and hit me in the head with a hammer, there it is. You don’t have to be looking for this guy to see him. It’s not a struggle. He just hits you. Look at the backside of the river when you’re on 179 and he (or she) strikes you like a rainbow. 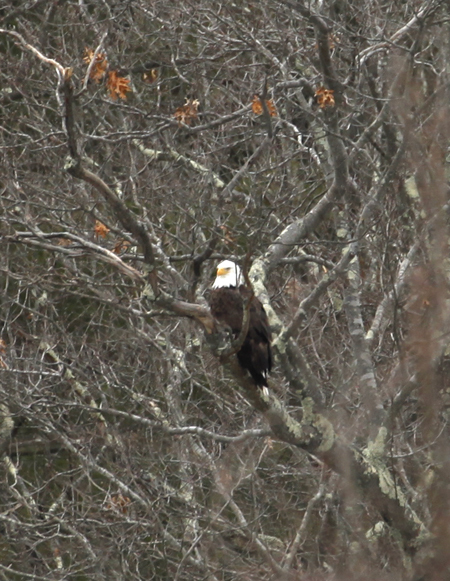 He is on the opposite side of the river from the road & bike path, but easy to see. So I think, “STOP!” I do it. I turn in a driveway right after Center Street in Collinsville and am telling myself the whole time not to wreck the truck. Look. Don’t pull out in front of somebody. I was way too excited. I got the truck turned around and stopped in the parking lot of the gas-station-turned-repair garage off of Maple Avenue. I got out. I took the pictures there, then went down to the Police Station to turn around and parked on the side of 179. I had to tell myself to put my seat belt on, I was so excited. I think I see a nest lower right in the first picture. If you look close, he appears to be calling. The other pictures are below.